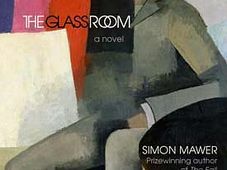 One of the most acclaimed books to be published in the last couple of years is the Man Booker Prize shortlisted novel, The Glass Room, by the British writer, Simon Mawer. 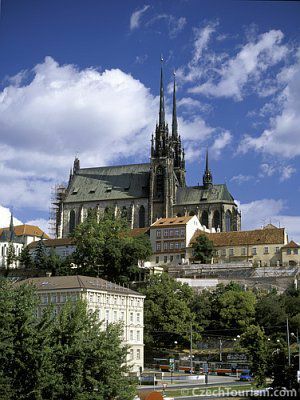 It is a book with more than a passing relevance to the Czech Republic, as the hero is a building that stands to this day on the edge of the city of Brno. 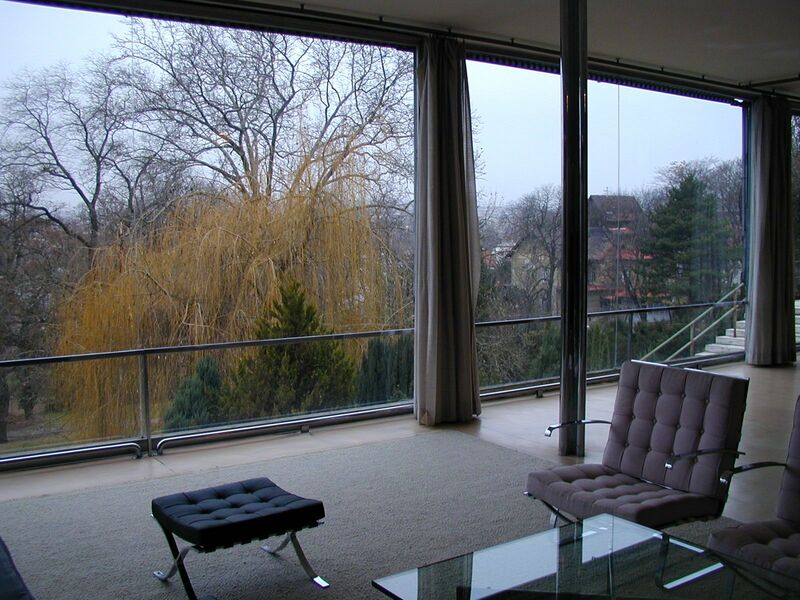 Simon Mawer, photo: author The Villa Tugendhat, designed in the late 1920s by Mies van der Rohe, is a celebration of steel, glass and space, an enduring reminder that modern materials can make for exquisitely sculptural architecture. In Simon Mawer’s novel, the villa takes on a fictional identity. He creates two hugely likeable characters in the couple who commission the villa, Liesel Landauer and her husband Viktor, a thriving Jewish industrialist. As the Nazi occupation looms, they are forced to leave the house of their dreams and the villa becomes an SS-run clinic, a small part in the mosaic of the Holocaust. After the war, its slide into obscurity continues, although the villa and in particular its amazing “Glass Room” remain closely tied to the fate of the people who come and go in the decades that follow. Their lives intertwine, reflected through the fate of a single building. 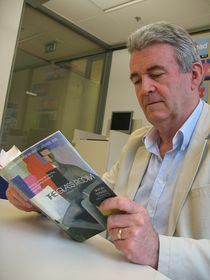 Simon Mawer was in Prague recently and I took the opportunity to talk to him about his book. I began by asking him how difficult it was to write about a building – capturing a sense of light, space, texture and movement in words. 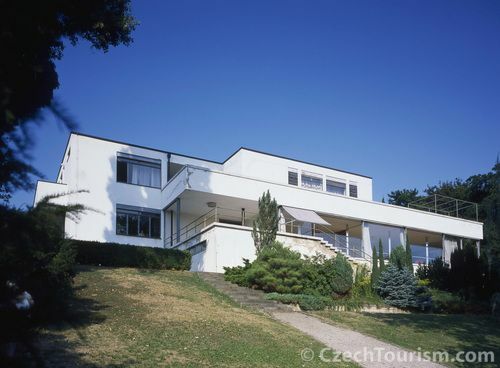 The Tugendhat Villa, photo: CzechTourism I find the scene very interesting when Liesel, one of the central characters in the book, comes back to the house after many years; she’s blind, so she is actually experiencing the building through how she feels the space, through her senses. The building, the Landauer Villa, makes no attempt not to be the Tugendhat Villa, which really does stand in Brno, designed by Mies van der Rohe. You even put Mies van der Rohe’s words into the mouth of the architect in the novel, Rainer von Abt, when he talks about being a poet of space and light. I find it fascinating that we have this building, which survives through this very traumatic period of Czech history over seventy years, while people and go and horrendous things happen. Yet the building, the work of art, remains there from beginning to end. And all around them is the Glass Room, a place of balance and reason, an ageless place held in a rectilinear frame that handles light like a substance and volume like a tangible material and denies the very existence of time. 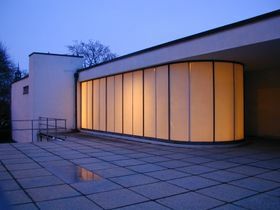 And in a sense this is a building which embodies the spirit of internationalism, of openness. And this book, The Glass Room, is not your first book set in Brno. You also wrote Mendel’s Dwarf, a novel about Gregor Mendel, the father of genetic science, who lived in a monastery in the 19th century in Brno. Tell me about your interest in this country. 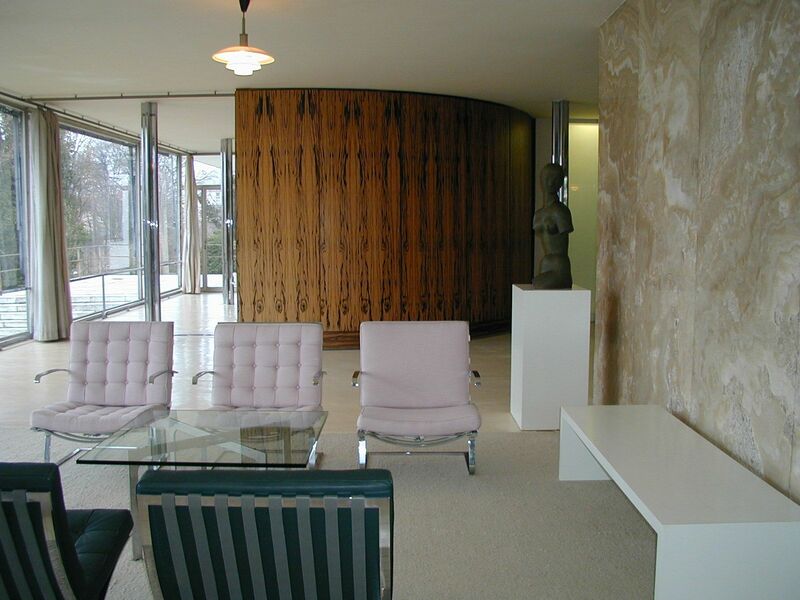 Some of whom drift in and out of The Glass Room – people who visit the Tugendhat Villa, or Landauer Villa, as it is in the novel. You mention Milan Kundera’s father. 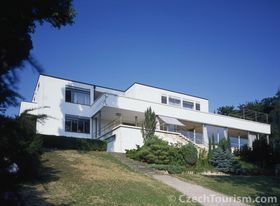 Comparisons have been made by critics between one of the characters in the novel, Tomáš, and Tomáš in The Unbearable Lightness of Being, who in a sense is a similar character, living in communist Czechoslovakia and looking for his own identity through his affairs with women. It is interesting that Tomáš is a doctor. There are several doctors who appear in the course of the book. There is also Hauptsturmführer Stahl, who is a horrific character from the time of the occupation, who is carrying out experiments in eugenics, in human genetics. 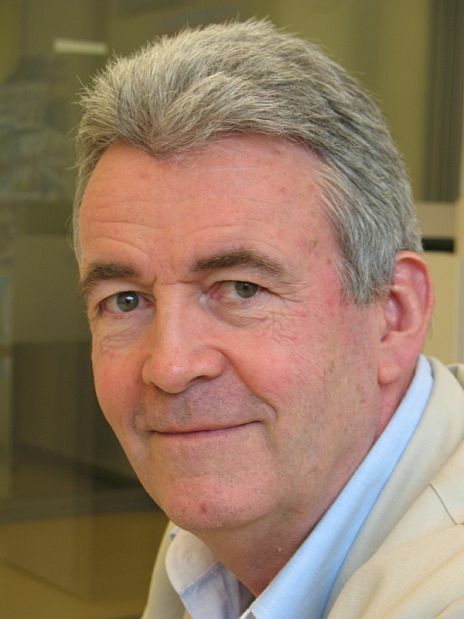 In your writing and also as a biologist I know that you are interested in the relationship between science and art, and between science and morality. After we have seen a lot of passion and warmth in the earlier part of the book – and the wonderful descriptions of the onyx wall that the architect persuades Liesel and Viktor to commission him to include in the house, then there is a sudden turn. They have to leave the building and it becomes a place where genetic experiments are being carried out during the German occupation. Hauptsturmführer Stahl, whose name actually means “steel” in German, is carrying out these experiments. Here is an extract that puts the building into this different, and horrific context. Precision, the cool gaze of scientific objectivity. 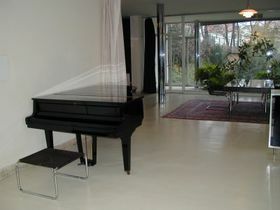 The measurement is as perfect as the dimensions of the Glass Room itself. And, of course, we all know what these experiments were part of. They were part of the machinery of genocide. Was it very hard writing about the Holocaust? 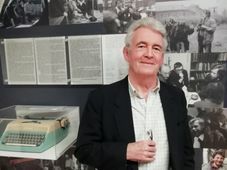 It is a subject that so many people have written about and it is very difficult for us, people who were born after the Second World War, to be able to approach it in a way that is meaningful or honest. And in today’s science, with advances in the study of DNA etc, is there a danger of that coming back, because there are all sorts of scientific measurements that can be made about where a person’s origins are, that seem to us today far more scientific, or more objective – for want of a better word – but could potentially be abused. It’s quite a scary thought. Another thing that I find quite disturbing in The Glass Room is that there seems to be a great deal of fatalism in it. People aren’t really able to influence their fates. I read one of your essays, in which you ask the question, “What if God were to play dice?” There is a sense of us being in a world where nasty things happen to us that we have precious little chance to influence – which seems to be the case of most of the characters in The Glass Room. The Glass Room has recently been translated into Czech, and your earlier novel also set in Brno, Mendel’s Dwarf, is about to appear in Czech. You’ve been travelling around the Czech Republic over the last few days – what have been your impressions of how people have received these books? And you were in Brno as well, where the book is set. In fact the town “Město” is translated in the Czech version of the book as “Brno”. So there’s no doubt where we are. Did you have the impression that in Brno your book was particularly welcomed? I’d like to ask you about your next book, which has the working title “Trapeze”. Can you tell us a little about what it is about? The Tugendhat Villa You’ve managed to have a career as a novelist in parallel with a career as a schoolteacher of biology. It astonishes me that you’ve managed to combine the commitment required to be a teacher with the energy to write novels as well. Do you think that the children are more motivated and that there aren’t the social problems that you might encounter in a more typical school? And you actually play with the very name of the room, the Glass Room, which in German is “Glasraum” – the word “Raum” has all sorts of other associations in German about space. And in Czech it’s “pokoj”, which means “peace” or “tranquility” in Czech as well as “room”. You enjoy these puns, don’t you? In a sense the whole book strikes me as being something of a gem. It’s beautifully crafted. Have any critics said that maybe it’s too beautifully crafted, that it’s too perfect? The Glass Room is almost empty. The piano stands where it has always stood, in the space behind the onyx wall, but except for that and a couple of chairs, all the rest has gone. In some ways this has returned the room to its moment of birth, when the builders and the decorators left it and the furniture had yet to arrive. Just the space, the light, the white. Just the gleaming chrome pillars. Just the onyx wall and the curved partition of Macassar wood. The cool, calm rationality of the place undisturbed by any of the irrationality that human beings would impose upon it. They pause for a moment and look.